Stoking Your Innovation Bonfire by Braden Kelley (John Wiley & Sons, 2010) is a highly readable, helpful book about the practical side of innovation, including guidance on building a culture and processes that support innovation in a corporation. Braden Kelley writes with the benefit of not only having many years of experience in supporting innovation, but with the insights that come from one of the best innovation networks on the planet. Braden’s Blogging Innovation effort has brought together numerous innovation thinkers around the world to share and contribute their insights on innovation success. Braden has many minds he can tap and the collective wisdom of many stars to guide his thinking. Braden’s experience in innovation shows, for example, when he discusses the different innovation needs companies have depending on their innovation maturity level. Trying to run an open innovation program for a company just getting started on innovation could be a mistake–especially if internal systems for gathering and evaluating innovation concepts aren’t yet in place. He also recognizes the need for long-term innovation strategy, not just short-term reactive strategy, to help a company survive in a world of disruptive innovation threats. Yet a focus only on long-term innovation bets could leave a company crippled by missing the short-term gains that are needed to still be thriving when the long-term bets pay off (if ever). His thoughts remind me of the Ascent of Collaboration™ model that Innovationedge uses in helping corporations decide where they are in terms of innovation maturity relative to open innovation and external collaboration. Guidance to the corporation must always be tailored to their level of development in innovation. A strength of Kelley’s book is his use of numerous examples, mostly from large, well-known companies like Apple or Amazon. One of my favorite case studies occurs early in the book (pp. 14-16) and deals with the rise of General Motors and how they overtook Ford through the vision of Alfred Sloan, who saw the need for market segmentation, good design, and innovation in the business model by offering financial assistance to dealers and customers through GMAC. Kelley provides practical guidance on some of the basic of innovation within a corporation. He offers, for example, an idea evaluation checklist (pp. 69-70) to assist in screening ideas from a brainstorming session. He also gives the very important lesson that innovation often must proceed slowly, and that a company must be prepared to pursue “slow innovation.” Companies must evaluate where they are on the innovation curve and determine when they must be prepared for many years of slow progress before a technology will be ready for commercial success. Such discipline in thinking and planning is essential to avoid rapid disappointment and premature abandonment of potentially successful concepts. Apple’s iPod is one of several case studies of slow innovation considered. Kelley also addresses the major issues of organization, culture, and processes that are crucial for innovation success. Breaking down internal information and innovation barriers can be essential for improving innovation in a modern company. Creating a system that can manage innovation and maintain the flexibility needed for innovation success is a demanding challenge, but one that leaders need to face and embrace. 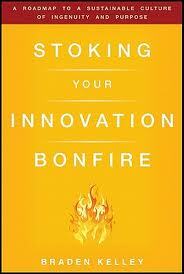 Stoking Your Innovation Bonfire can help with that challenge. For both leaders and champions of innovation at all levels, Braden Kelley’s book is definitely worth the read.